Yoga and surfing – it’s a magical combo. 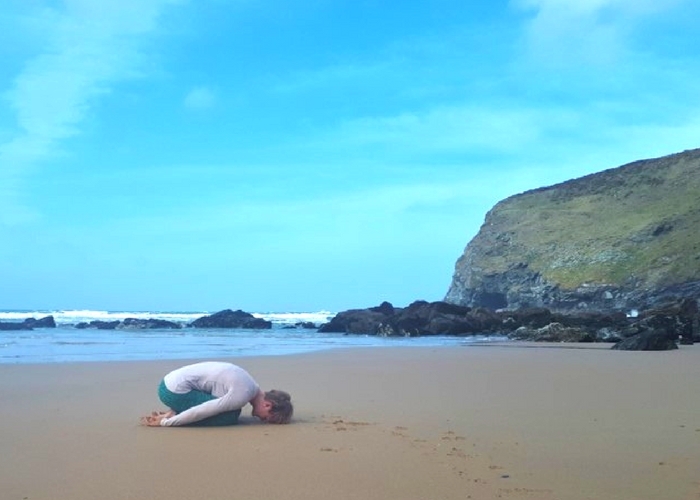 When I first sat down to think of the asanas that complimented surfing, I realised I needed to ask my fellow surfing buddies what it was that their bodies craved when they came out of the water. Apart from a cup of tea. 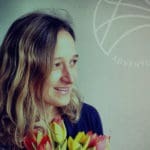 Unsurprisingly, everybody’s bodies gravitated towards a different ‘go to’ stretch because just like in our yoga practises, we all feel and experience the same thing in very different ways. So here are the postures that a group of tea loving Cornish surfers came up with as their post surfing must do’s. As a long boarder, this is my go -to. Humble child’s pose is not so humble at all. Gently stretching the ankles and shins, knees, glutes, lumbar and allowing the spine to softly roll forwards with full support. There is a lot going on in this more restorative posture. To combat the spaghetti arms and allow your shoulders to fully relax, we love having the arms resting beside the body instead of stretched out in front. From your hands and knees bring the big toes to softly touch and, on an exhale, sink the hips back to rest onto the heels. Feel free to use a rolled towel or a cushion under the ankles or between the feet and glutes. Allow the body to fold forwards over the thighs and the forehead to rest on the floor or supported by a block or cushion with arms either out in front or hands resting behind next to the feet. Allow your body to rest and breathe deeply but without force for up to three minutes. This is the one posture everyone agreed on and for good reason. Great for easing lower back aches, gently twisting the spine, releasing tension in the neck and stretching the shoulders. It’s a one hit wonder posture. From your hands and knees, allow your left hand to slide underneath the right arm, bending the right elbow to guide you gently down to the floor resting left shoulder and temple on the ground. Keep the hips stacked above the knees. If you feel confident that you are not sinking weight into your neck you can slide the right hand out in front to allow for a greater stretch through the side of the body. Repeat on the other side. Standing feet hip width apart, let your pillow/cushion rest in your hands in front of you. On an exhale, bend the knees and hinge from the hips to fold forwards. You will trap your bolster between your thighs and the body allowing you to let go and relax the arms and shoulders. 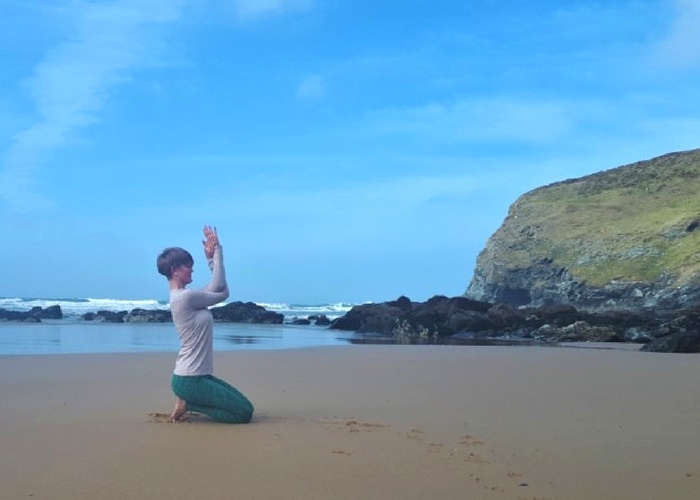 Also known as ‘snakey snake’ by one of our surfers (and now lovingly renamed by us all) – the arms aspect of eagle is a great stretch for the arms and shoulders. Combine it with a toe squat to stretch the feet at the same time for an extra boost. From hands and knees, tuck the toes and sit back onto the heels. This is a strong stretch so do not stay longer than your body is comfortable with. With prayer hands at heart centre, keep the palms together as you raise them up to bring the forearms and elbows to come together in line with the shoulders. It may be that you want to stay here if your shoulders are tight. Let the left hand come away, swinging underneath the right arm, wrapping around so that either the backs of the hands come to touch, or the fingers of the left hand can rest in the palm of the right. Ensure that your elbows stay up in line with the shoulders and when you exit the posture you do so slowly, releasing the left arm and then the right. Don’t forget to do the other side too! 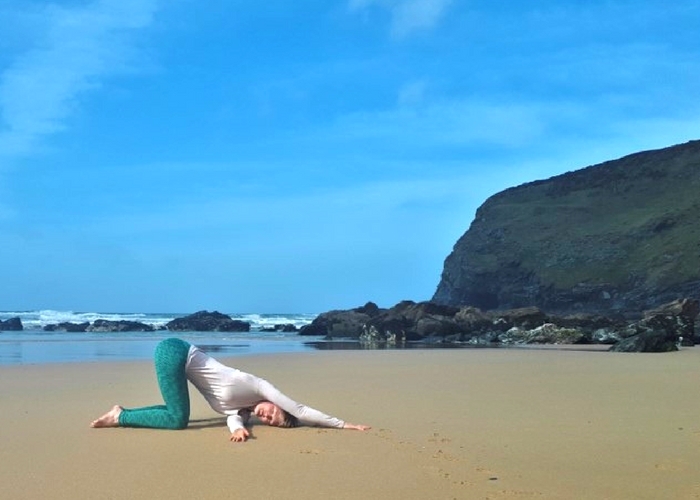 This grounding asana helps stretch the hamstrings, release the lower back and create a wonderful sensation of space through the side of the body. Our favourite way to transition from each side is to spend a few breaths in seated wide leg forward fold before moving to the next side and then back again. Sitting cross legged, slide the left foot out, the right foot remaining tucked up. Let the left-hand rest gently on the left leg, above or below the knee but not on top. Keeping a straight spine and an open chest facing forwards, on your inhale lift the left arm up, finger tips facing the sky. As you exhale, allow the lifted hand to reach overhead as the left hand slides further down the leg. Do not force your body to go further than it wants, allow your body to find a space where it is comfortable to remain without any stress or strain for a minimum of three breaths. 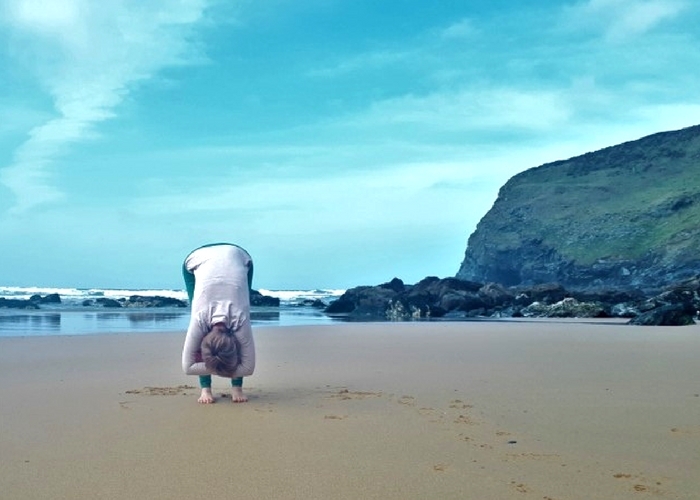 Thanks to Amy Williams our resident Cornwall Yoga teacher for these top tips from her surfer friends in location! 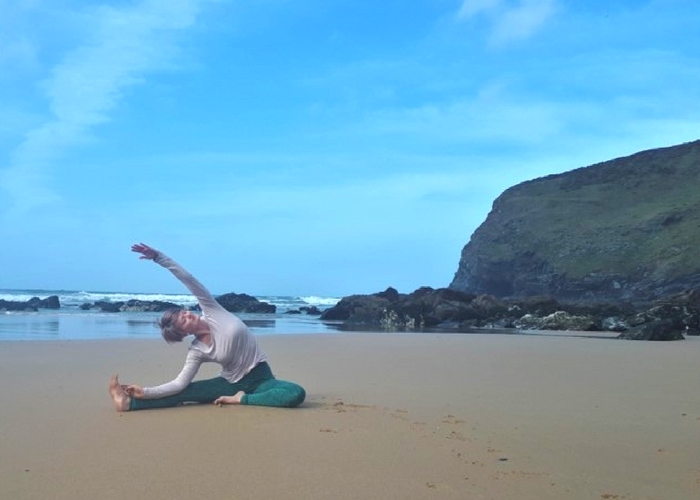 If you would like to try out surfing and yoga with Amy then come and join us in Cornwall in July from the 14th – 21st for a week, 3 or 4 night options. 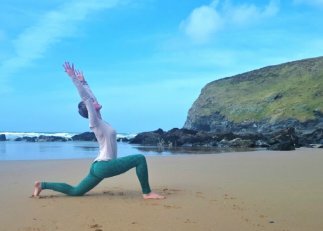 We run regular surf /walking and yoga retreats in Cornwall every year so please check our calendar page for dates.